Each Yup’ik region has distinctive traditional designs for its clothing. 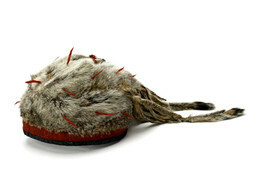 This Kuskokwim River boy’s cap is made from the white-spotted skins of arctic ground squirrels, with a weasel (ermine) “tail.” It is ornamented with white beads, strands of red yarn, and red-dyed tassels of squirrel skin. John Phillip, Sr.: Uivqurraq. Wangkuta tua uivqerranek pilallerput waten ayuqellruut. Wiinga-ll’ pingqellruunga imumi. Waten ayuqngata uivenqegngata uivqurranek pilarngatellruat. Neva Rivers: Eplet uivqerrameng pian, wii-llu umiqurraq. John Phillip, Sr.: Aperyaraput ayuqenrilameng. Wiiterikaniameng pingqellruunga. Neva Rivers: This one is soft. This [body of hat] is qanganaq [arctic ground squirrel]. Beads on it. Qaterliarnek [small beads]. Joan Hamilton: Atam una. Cauga? Virginia Minock: Summertime [skin], I think. Neva Rivers: Makut-llu uitermun pimaluteng. Uiterrcimaluteng. Uiteq tava-i kenugetkelqaat. John Phillip, Sr.: Uitermeng qaraliliumaluni. Aron Crowell: When did cloth become available down in your area? Neva Rivers: I think we got those from Russian miners that came traveling around. That’s the time they got all those tin things and the cloth. Those were the first Kassaqs [White people] they’d seen, and they’re the ones who brought all those materials, the ones that we never had in Alaska. They make fancy [decorations] out of that. Aron Crowell: That red, especially that red blanket cloth that the Russians brought, was around even in the 1830s and 40s and earlier. John Phillip, Sr.: Makucinek wiinga tangtullruunga. Maten ellangua makucinek piaq, makucinek pitarluni. John Phillip, Sr.: Caaqameng makut aturluki calilartut augkut tangvalallrenka. Makut, makut caqnek picaqnganaki kavirliit makut waten ayuqellriit pilallruit. Tamaa-i tamakut iliini pilugunun pilallruit maagun. Suzi Jones: So is that a boy’s cap? Joan Hamilton: Angutet makucineng qaralingqessuicukluki. John Phillip, Sr.: Wiinga-w’ augkuneng pilillrukait qaterliaranek pilirluku-llu pilillruaput. Joan Hamilton: Arnat-qaa pikait wallu-q’ angutet piksukluki umyuartequten? John Phillip, Sr.: Arnat augkut taqur . . . qaa? Arnanek tam makucinek tangerngateksaitellrulrianga. Joan Hamilton: Mm-hmm. The difference was that the women’s had tassels. Neva Rivers: Tan’gurraat taugaam pingqetullruut. John Phillip, Sr.: I never see that woman’s [hat] like that, that’s only a man’s. I had one, when I was a boy. John Phillip, Sr.: Tua-g piliyugaqamegteki yuteng pililallrullikait. Atulallruaqa kiagmi taugaam. Joan Hamilton: Wangkuta tua makuneng-qa pingqerrlallruukut? Neva Rivers: Mm-hmm, uggun qaralingqerrluteng beads-aneng. John Phillip, Sr.: Makut-wa tua-i ingrini taugaam makut pitulriit. Bristol Bay-mi-ll’ pituluteng . Qagkut Kuigpiim. John Phillip, Sr.: Nunivaarmiut-llu piaqluteng waten. Neva Rivers: Ii-i [yes], different pattern. Joan Hamilton: The folks from all different regions, they wore this, but they used different animals depending on what’s intrinsic to that area. John Phillip, Sr.: Piciatun qaralingqelartut tamakut. Joan Hamilton: Picimegtun taugaam pivkenateng. Neva Rivers: Their own way of decorating. They all have different designs. Hooper Bay has their own designs, and the family has their own designs to make. Not ones from other villages. So they can tell by their design who they belong to. There’s a Hooper-Bay-style way of making things, and this is from the Yukon and the Kuskokwim. From up north. The way you see in all the pictures they have different garments, they have their own designs. Joan Hamilton: Ciin maa-i piyuruciita? Joan Hamilton: Ilumun [that is so true]. [Laughs.] We’re all mixed up. Neva Rivers: I don’t use my own design or way of making qaspeq ]dress-like women’s garment usually below-the-knee length]. (6) The way I want to make a design is the way I like it. 1. A nacarraq is a “cap, hat; small cap or hat (in contrast to a hood)” (Jacobson 1984). 2. An uivquq—the base of uivqurraq (-rraq indicating a smaller of type headwear in this context)—is a “circular cap of squirrel or other skin with beaded decorative bands.” The root uive- “to circle; to revolve; to rotate” is also the base for words referring to roundness (Jacobson 1984). 3. This explanation of uivqurraq is from the discussion of hat E127331. 4. This information on the availabiltity of textiles occurs in the discussions of grass socks E153865 and hat E127331. 5. An anugun is a “male human, man,” and the plural form is angutet (Jacobson 1984). 6. A qaspeq is a “thin hooded garment, usually of cloth, worn as a parka cover, as a jacket or dress;” also spelled (anglicized) kuspuk (Jacobson 1984).